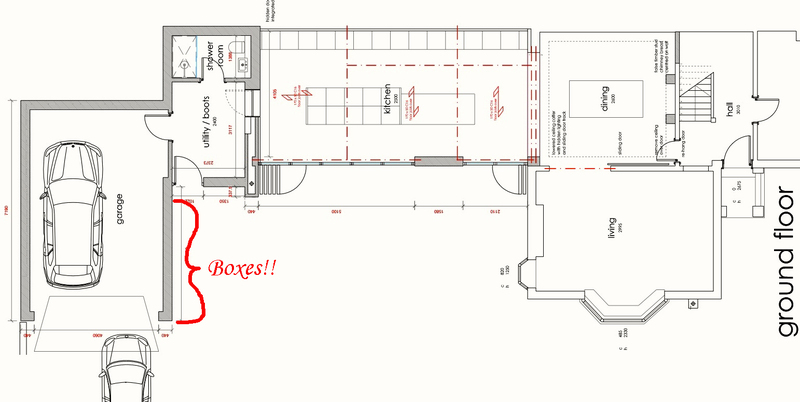 So, this week I did that thing with my builder which makes them twitch, shake and quietly sob. I started the sentence with his name stretched out in that persuasive, slightly wheedling way, then followed it with “I saw this thing, and it doesn’t look difficult at all, just looks really interesting. 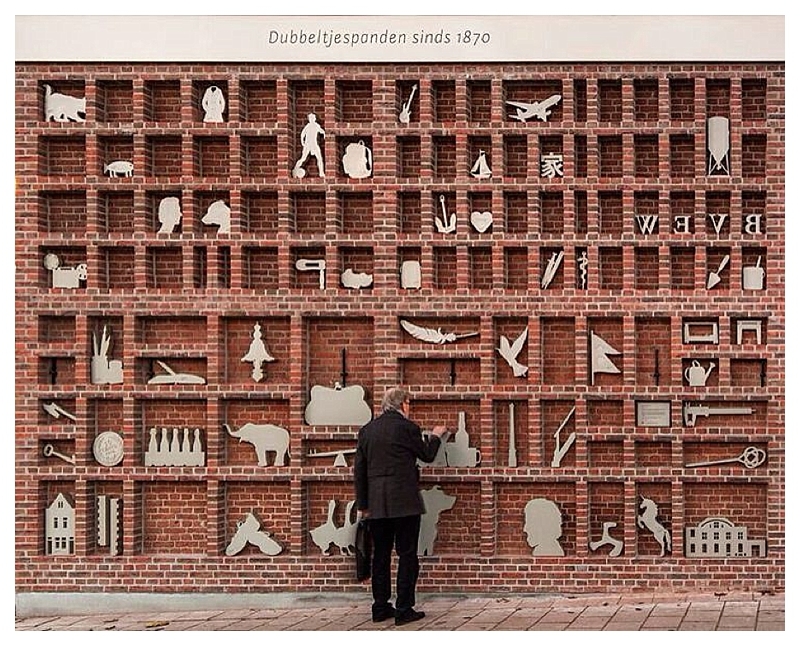 I’ve been thinking about this wall for the last few weeks, I know you’ve already quoted, but could we just look at it and see if it’s doable…..?” And then went on to describe the most complicated brickwork in the history of the modern wall and showed him the above picture at which he exploded with laughter. Then looked at me to see if I was serious. I was totally serious. He went white. There were murmurs, shoulder shrugs, head shakes and eye rolls, yep, the full range of bodily builder movements designed to dissuade the client from daft ideas. But the lady was not for turning. How amazing is it? 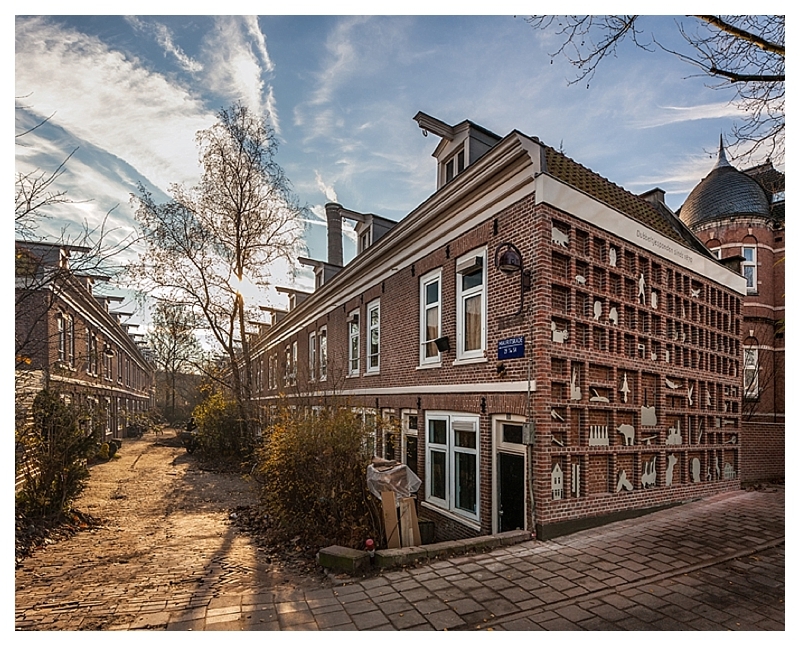 Designed by Dutch designers Studio Wessels Boer and installed onto the side elevation of a Dime House in Amsterdam, this wall / art project showcases aluminium silhouette objects which typify life in the immediate location with objects suggested by local residents. The whole wall looks like a type case for print and I thinks it’s absolutely spectacular. And I wanted one in my garden, right here: The wall has been designed as a straightforward face of brickwork but when I imagined how it would look it seemed to me that it would be very over-powering and solid, a bit over-facing and not hugely attractive or useful. Having mulled over the Amsterdam wall, my thoughts are to create a small section of recessed boxes, using them to showcase plants and pretty garden stuff, but also act as a practical shelving unit when cooking or having parties and even act as an external display case for photo shoots. On the Dime House, the bricks had been an addition to the existing elevation of brickwork but we couldn’t just build the external leaf then add to it as there’s a doorway right next to the brickwork face so we didn’t have the space. Nor could we simply recess the boxes as only the outer leaf of the garage was supposed to be reclaimed brick and the inner leaf was ugly grey blockwork. Hmmm. We ummmed and ahhhed and debated the best way to do it….bricks on end? ties? half bricks? steel brackets? headers? After much discussion, the best solution was to build the internal leaf of brickwork to that wall of the garage out of bricks not block, and to neatly point each side. This would give two positives: 1 – The internal face of the inner leaf in the garage now looks gorgeous, see below, and the rest of the walls will be panelled for when we do courses and events so it all looks equally fabulous, and 2 – The external face on the garden side will form the back of the recessed boxes when viewed from outside. Brilliant! 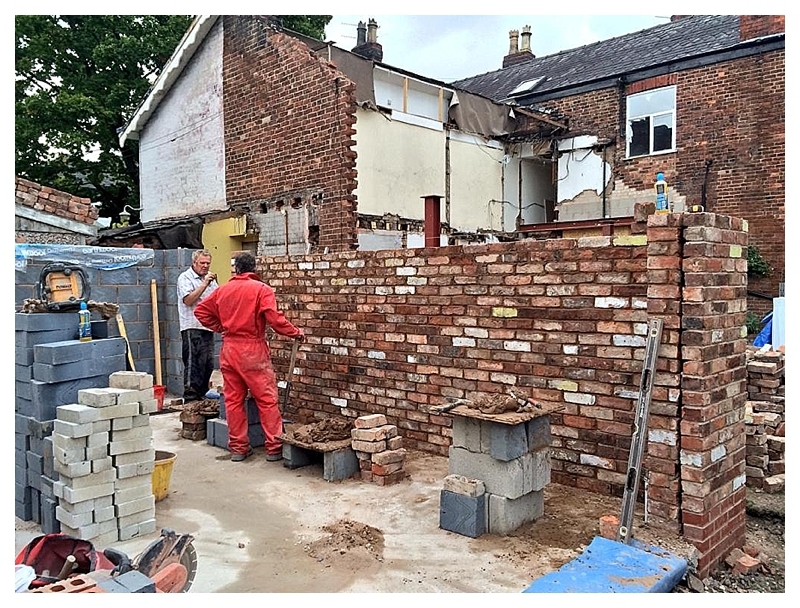 This is the wall being built today with the guys standing inside the workshop /garage – I love it already! Watch this space for how it progresses. I’m convinced it’ll look amazing, though concede it will only be a fraction as amazing as the Dutch version. Read more about the Amsterdam project HERE All photos by Hans Peter Föllmi and Marjet Wessels Boer (except the one of my house obv!) 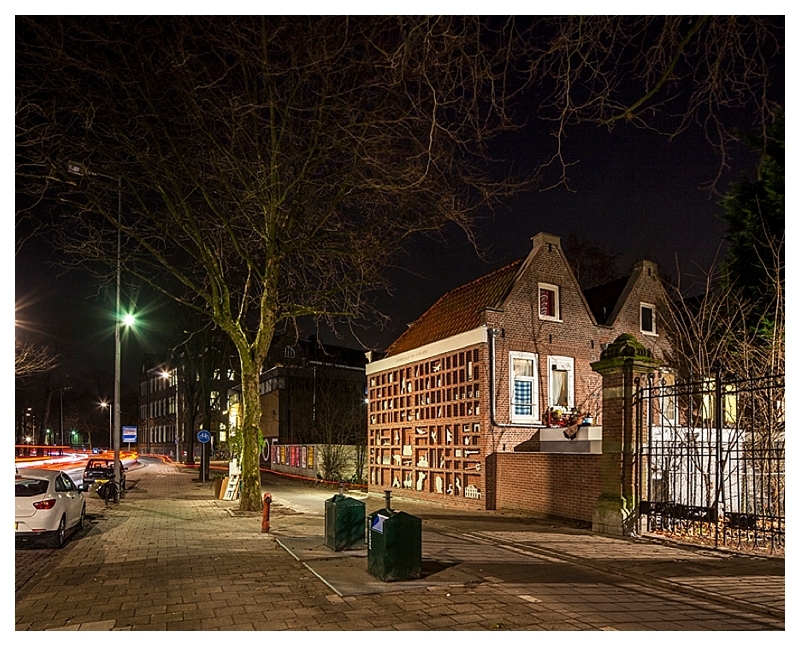 All images courtesy of Studio Wessels Boer Thanks to DesignBoom for showcasing such a wonderful house. I can´t quite imagine which wall yo mean, but those pics are spectacular! now I have finished all the posts so far on this build and I can´t wait for your next update, such an exciting project. I want a little section of the outside wall of the garage (which faces into the garden towards the kitchen doors) to have those recessed boxes in it, so it looks more interesting and is more useful. It’s a big experiment!